Happy, Friday, guys! 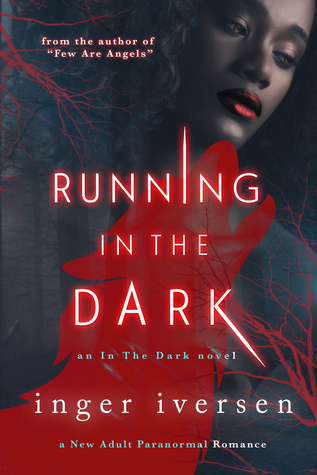 Welcome to the Running in The Dark Book Tour hosted by Xpresso Book Tour. Be sure to follow the full Book Tour Schedule and the other posts :-). Protecting Bessina means defying the leaders of the Nation, an act that has them both running for their lives. The more Trace fights to disappear from danger, the more he unravels the secrets crafting his world—secrets he must unveil in order to finally save a life, instead of destroy it. Okay, I can do that. If you love the paranormal, or ever wondered what goes on in the vampire underworld that may, or may not exist in real life, then you will enjoy this book. Now, I am not the biggest vampire-based/concept fan in the world, but I do love strong story and universe structure. At times, I forgot I was even reading a book about vampires, which means the story and characters were so immersive that I didn’t notice and I love that. Out of everything, the intensity and chemistry between Bessina and Trace is definitely the driving force within this book, never mind the fact that the two of them are running for their lives! XD If I had to put a level or peg their heat meter, I’d say it’s between 3 ½ – 4 out of five. As a fan of the slow-burning relationships, I was pleasantly surprised with the way Bessina and Trace’s relationship developed. The story timeline of the book is set to take place in a matter of 24 hours (roughly), but the author’s pacing and individual character explanation made it feel longer. The readers get to see both of their perspectives unfold as the story continues, painting clear mental and emotional paths of their journey ahead. While I enjoyed Bessina’s inquisitive and resilient nature, Trace was the true focus of this book due to his level of character development. I also felt it was because we just hit the surface of Bessina’s character development in this book. I found that the seriousness of Bessina’s (spoiler) sexual assault and the destructive emotional abuse she endured from her father growing up (both major points) took a back seat in the narrative. Although we deal with quiet a short timeline in the book, it would have been nice if more time were spent on Bessina’s emotional development. Yes, she discuses things with Trace, but it did not feel as though Bessina truly gets over those key emotional character beats. Instead, it felt as though she swept them under the rug and fell head first into her relationship with Trace. Inger Iversen was born in 1982 to Anne and Kaii Iversen. She lives in Virginia Beach with her overweight lap cat, Max and her tree-hugging boyfriend Joshua. She spends 90 percent of her time in Barnes and Noble and the other ten pretending not to want to be in Barnes and Noble. Direct Giveaway Link: : http://www.rafflecopter.com/rafl/display/a37ab70c37/?